Block Internet Access Excessive users of the Internet can be denied total access of the web, with a simple click of the mouse from the central console. By setting the Internet policy to OFF, all access to the web is blocked. Users are denied access to the Internet at the HTTP protocol. So whether they try to connect to the web through a browser or through other applications or documents, all access to the web is restricted. Easy to Manage BrowseControl reduces the burden on I.T. Technical staff since all the features can be locally managed by departmental managers and teachers who can enable/disable Internet access at departmental, classroom or individual PC level, or block unauthorised software such as games or any application which is a nuisance or dangerous. Enable/disable Internet access Totally block Internet access. Scheduler Schedule specific time slots during the day, week or month when Internet access is allowed. This can also be done on an individual PC or Group level with different allowed access times depending on your needs. Timer Allows Internet ON or Internet OFF for a certain number of minutes. White List Create a table of “Whitelist” sites which users are allowed to access to (e.g. Intranet, Project specific sites, course specific sites). 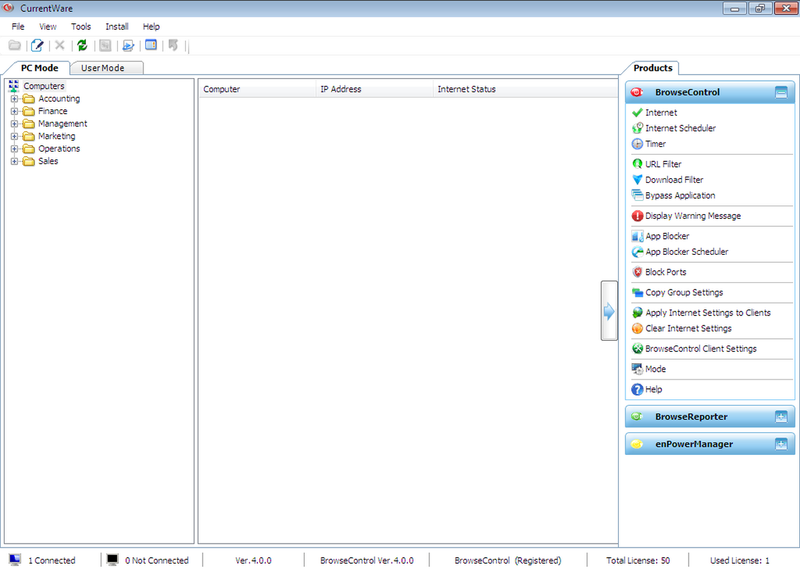 Choose to restrict any combination of WWW, E-mail, IP Addresses, FTP sites or ICQ/IRC/Newsgroups. Black List Deny access to specific URLs. 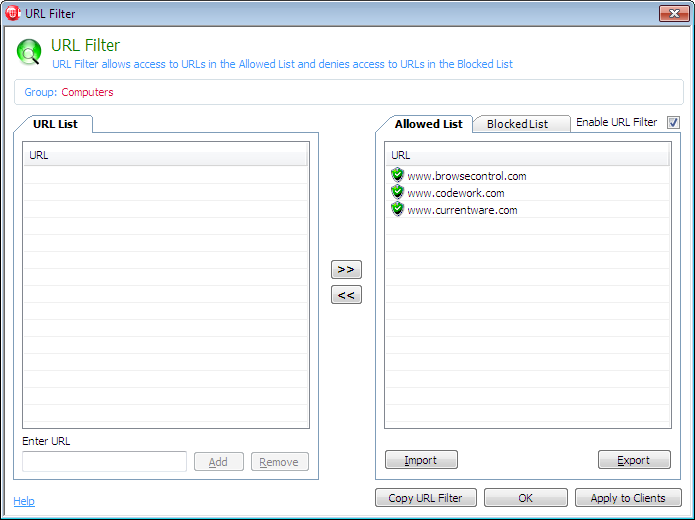 Create a table of “Blacklist” sites which users will be blocked from visiting. This can help to enhance your systems' setup if you already have a filter running. 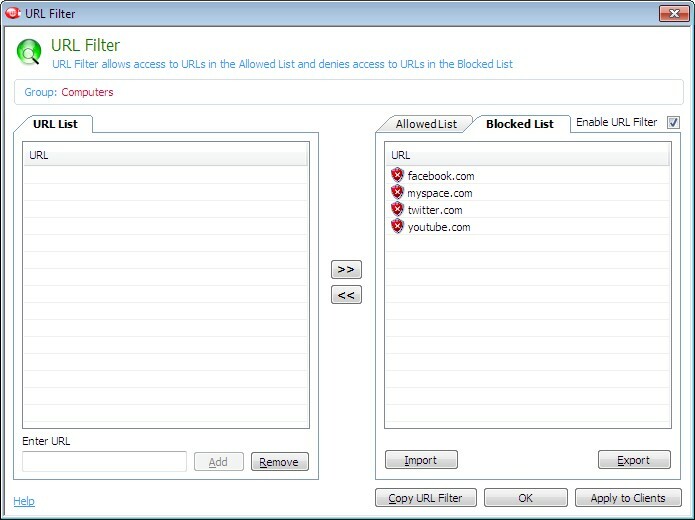 You can add the sites you want to block. Application Blocking Control what times certain software can be used or totally block usage of certain applications to stop the abuse of software. This will help enforce your computer use policy. Specify software applications to be blocked. Internal name of Program used i.e. will work even if user renames the .exe file. Offsite Internet Access Management Ensure that your offsite users/systems are under the same protection as your onsite systems. 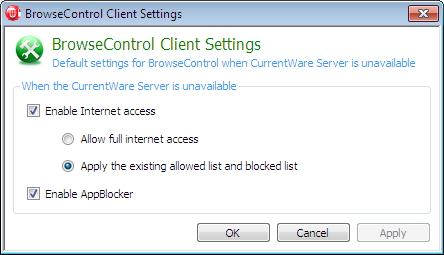 Even if the systems are not connected to the BrowseControl server, the Internet and App Blocker security policies can be configured to apply to mobile users/laptops. Multiple Consoles Install separate consoles in each department/classroom, to allow the mangers/teachers to manage their own individual employees/students. Each console can be configured to display only the users or workstations associated with the specific manager/teacher.